Recently my parents returned from a long vacation in Italy. Every time they take these trips I get the pleasure of not only hearing about the adventure but they bring me back something nice, no matter how I insist that they do not need so. Regardless, I do like having neat little items from around the globe so I can impress the three visitors I get a year. 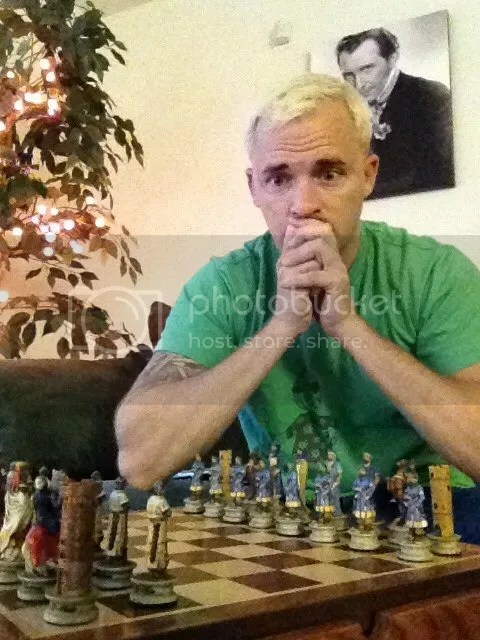 This year they brought me back a hand-carved chess set that is so beautiful, I am nervous to even display it. (Visitor #2 is a shifty one. He’s a dog) But when I put it together, I knew it needed to have a permanent spot on the coffee table. 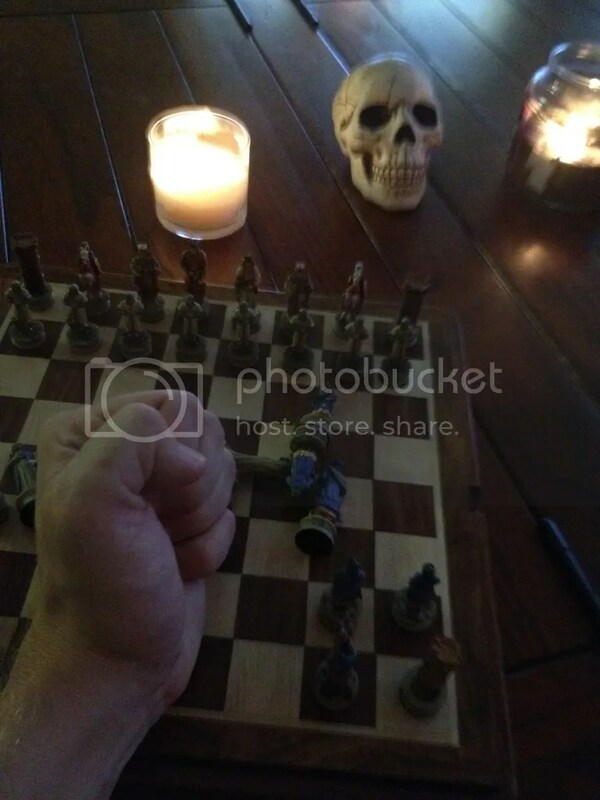 And then it dawned on me; I have never learned how to place chess. 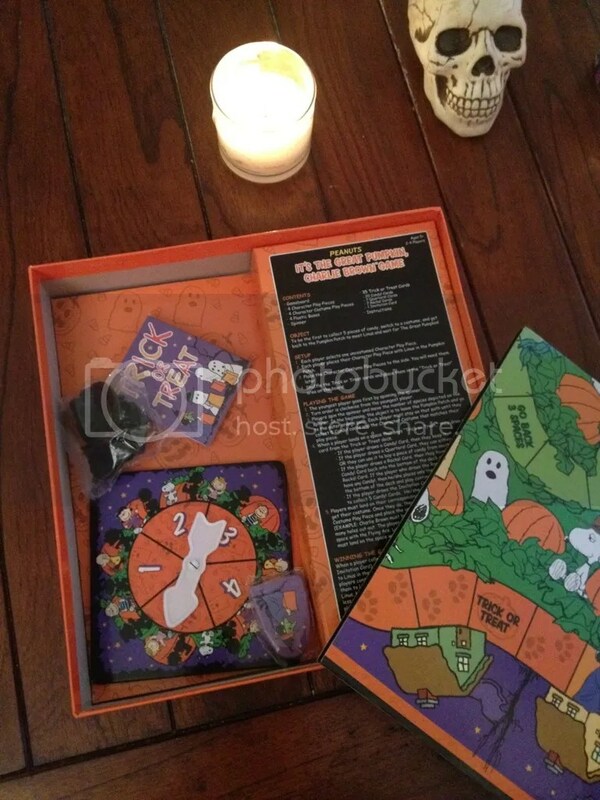 No, I need something a bit more my standard and with the Halloween season well underway, what better time to break out a board game to challenge my multiple personalities. 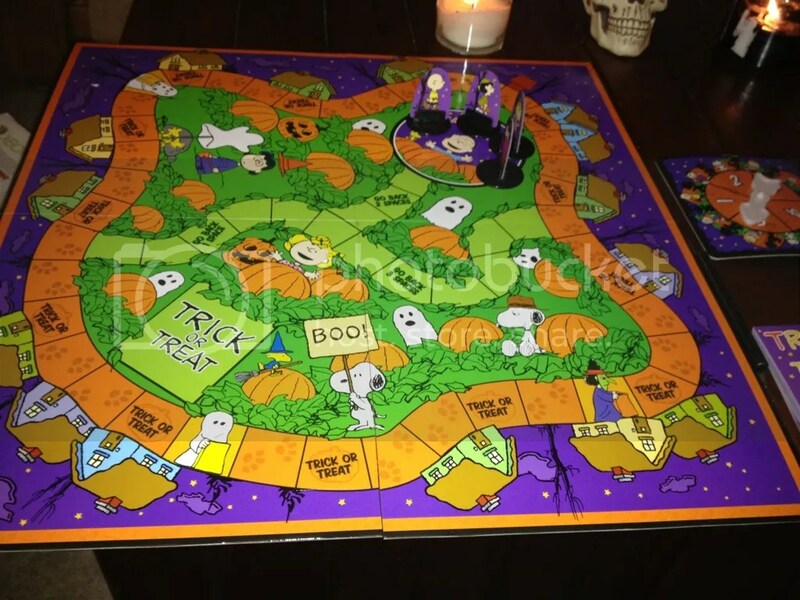 I present to you “It’s The Great Pumpkin Charlie Brown” board game for ages five and up. Now anyone who knows me or has ever read this blog will know my true love for all things Great Pumpkin. It really is a nostalgic link that I share with my Dad and no matter what is going on in life, when The Great Pumpkin is on ABC that last week of October, I am there. So, it is no mystery why I would choose to review this, rather than battle an imaginary Big Blue over chess. LET THE GAMES BEGIN, BLOCKHEAD! I have to admit, it is a pretty neat looking board. I may just hang this on the wall if I end up beating myself. And looking a little closer I see Snoopy’s brother Spike. It’s nice he paid a visit from his home in Needles, California. Know how I know that? From Dad. I still can’t believe I even remember that detail. 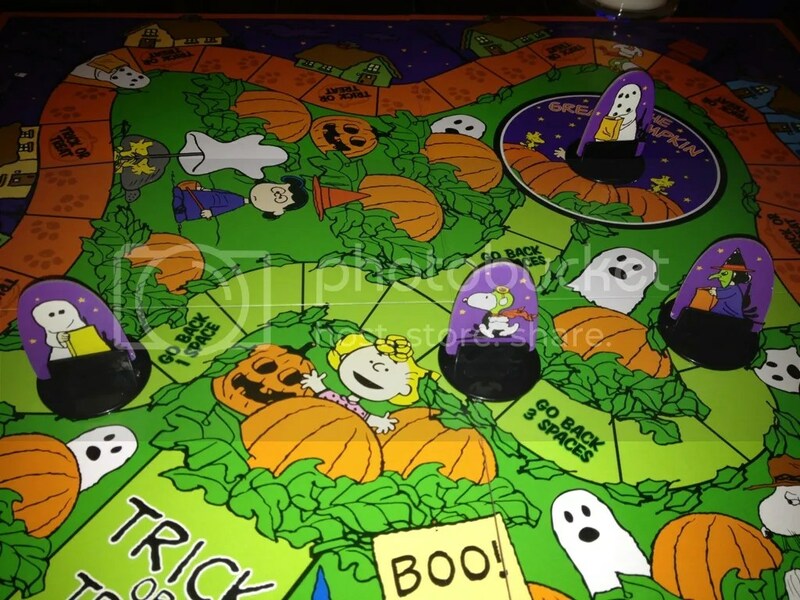 The cards dictate the fate of the characters or at least how quickly they can get in their costume and get back to the pumpkin patch. 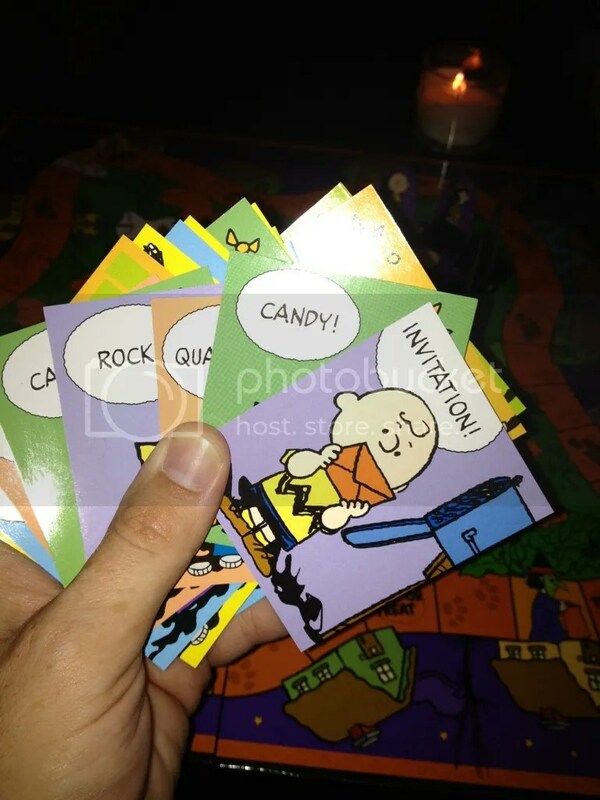 The various cards are: one invitation to the Halloween party (the mother of all cards and the character goes right into costume), twenty candy (collect five and change to costume), seven quaaludes (to spike the punch at the Halloween party), and seven rocks (draw one and the character surrenders a candy card). Hrm…apparently the quaalude card is really quarters. 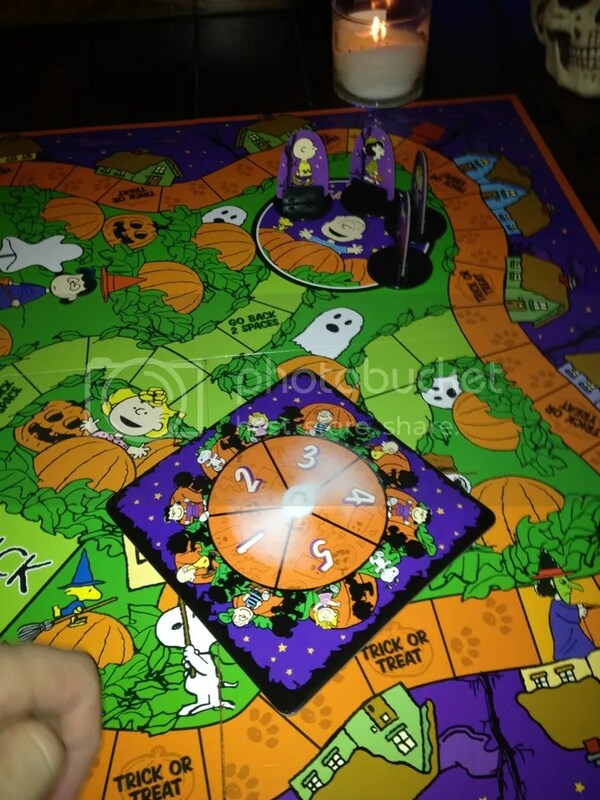 You can use this card to either spin again or buy candy from another character. Quaaludes would have been more fun but this is a kids’ game. And a waaaaaay we go! Spin the wheel around and around, where it lands…nobody…round…I hate rhyming. Anyway, Charlie Brown is in a race with Snoopy, Lucy and Sally to change into costume, trick r treat and be the first to meet Linus back at his most sincere pumpkin patch. Who will win? I don’t know because they are being moved by my alter egos; Phil, Gil,and Jill. I am Bill. And Bill will always root for Charlie. The first few minutes of the game were a bit frustrating because we all landed on the “move back one space” and drew rocks. Then we all drew candy. It seemed a bit redundant and it occurred to me that Gil never shuffled the deck! I would have but I can’t shuffle. Take a look. So after that shuffle method of “pick up off the floor” we again resumed play and eventually all players were out of the patch and roaming the neighborhood. For the first time in Charles’ life he drew an invitation card and rocketed to the Trick r Treat spot to change into his holy ghost costume. His luck is changing, says me! I don’t think I will bore you with play-by-play action of how many spaces Lucy moved or the fact Jill was hiding quarter cards up her sleeve so we will skip to the final few moments. At this point it really could have been anyone’s game. The path was mined with plenty of “move back 2 spaces” and there were plenty of quarter cards remaining now that I smacked Jill in her cheater mouth. I know it’s not morally right to place money on a child’s game but I raised the stakes with a cool fifty bucks. We were all in except Phil. He was a tad light but we struck a deal for barter and he has to do the winner’s laundry for a week and reenact “Camp Town Ladies” at a random wake. Oh my god I am the winner! And so is Mr. Brown. It really is refreshing to see him finally get one over on Lucy. Sure it’s no football field goal but when it’s a chance to give Lucy the middle finger, any opportunity is the right one. This one is for you Chuck. To the victor goes the spoils! Enjoy it Charlie Brown. 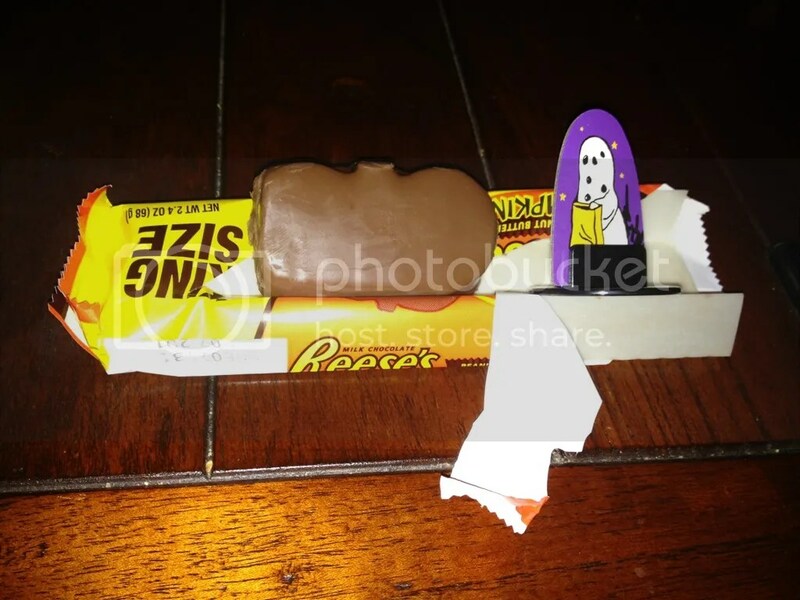 It has to be better than the crap you got along the trick r treat journey. 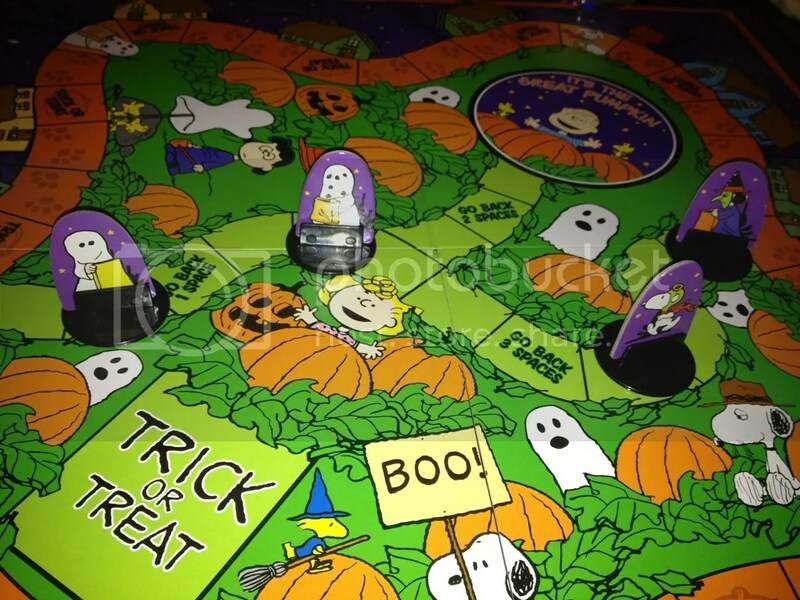 This is a great game if for nothing more than to roll around in Halloween nostalgia. 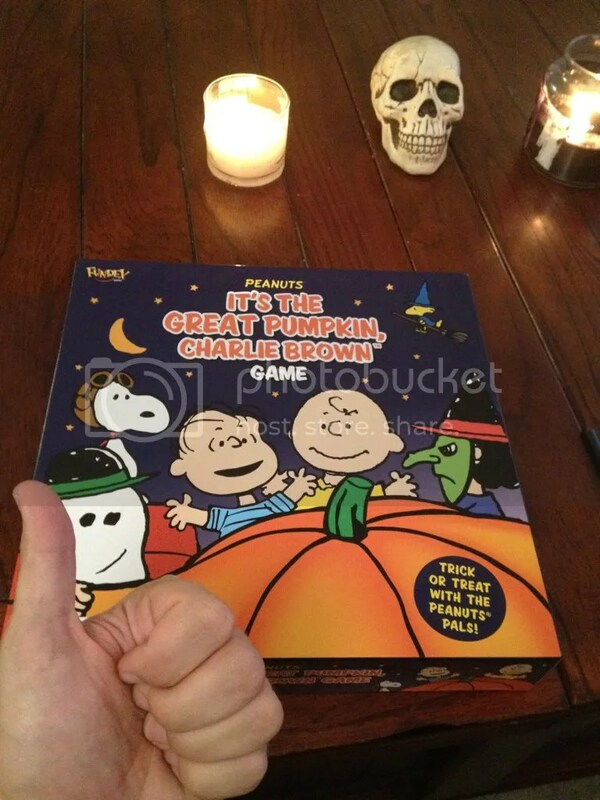 Perfect on a Friday game night with kids to teach them how awesome It’s The Great Pumpkin Charlie Brown is. It’s an important part of American culture and I embrace it every year, if only to relive the thirty minutes some twenty-five years ago with Dad, carving pumpkins and laughing hysterically over Snoopy’s gaff when he howls over Shroeder’s piano. I give it a solid A.
great piece. you accidentally left your receipt in the box you shipped and i saw a $5 Charlie Brown item and was quizzical than hopeful it might turn up via VM. i’ve been going back and reading the Peanuts anthologies (via a recommendation over on the Dino Drac comments) and am loving it. good ‘ol Spike from Needles. 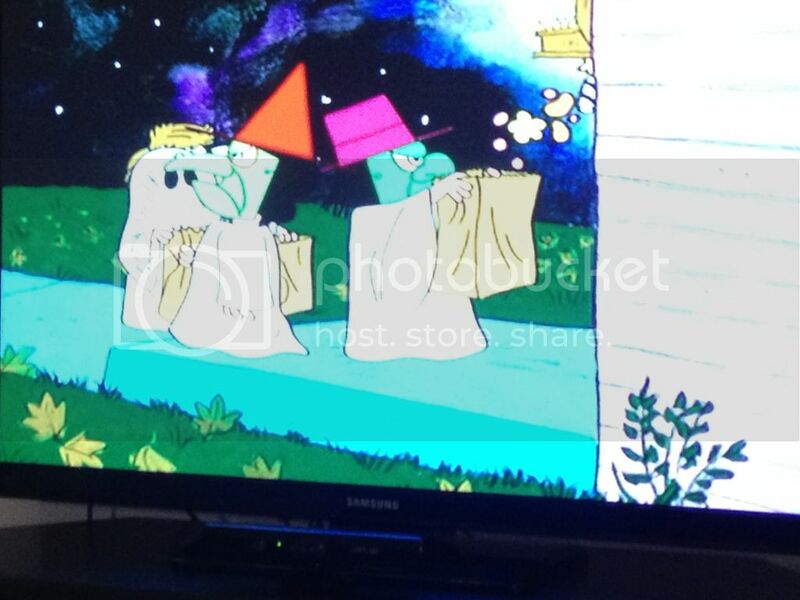 we shot the bulk of the Halloween special last night. lots of VM love. Dude, I am so excited. Thinking of doing some long awaited joint distant reviews for the Thanksgiving and Christmas season coming up if you are down. Looking forward to the hilarities of RTWTV. In fact I am off to watch this weeks episode now! yes sir! Tim and I have been able to coordinate schedules (not as much as we’d hope) but to keep active.. me and the RtW TV family (Nick, Eddie, Steve, Jessie, Paul, etc.) family have been less capable of getting anything going but I’m having fun working on as many projects as time allows! Brainstorm! 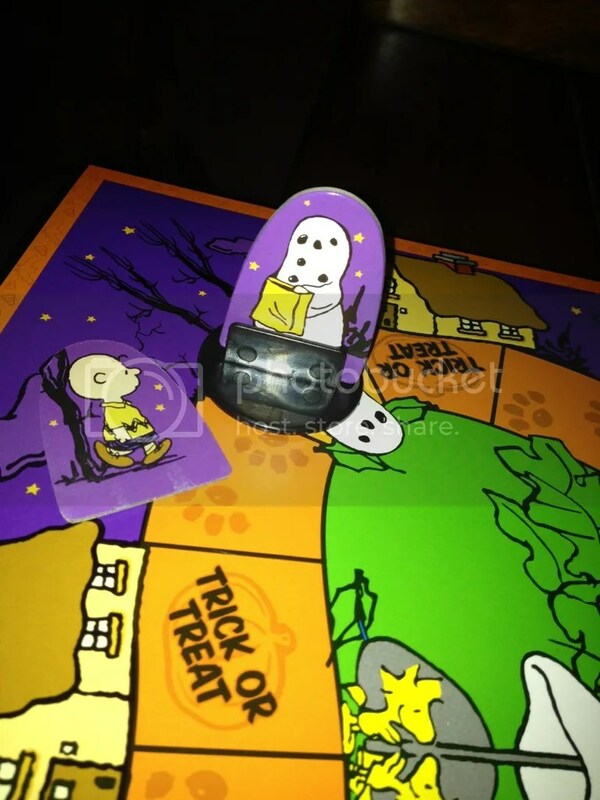 An RPG crossover between Peanuts and Friday the 13th. Evade the killer, get candy, or go on a rampage! Also, kill Lucy. Hey Will, how old is this game? It seems the Peanuts gang don’t get that much attention from the younger crowd these days. Is that a portrait of Peter Cushing on the wall behind you? Sometimes we’d like to try-out services but don’t need to spend a high price for these.